Although the bass clarinet had found favor in the past (Ellington’s baritone saxophonist Harry Carney occasionally toted one) it wasn’t until Eric Dolphy blazed the trail in 1960 that the instrument began to be more widely aired. In his seminal book Jazz German critic Joachim-Ernst Berendt writes, “unlike the conventional, clarinet, the bass clarinet can also produce colors that jazz saxophonists appreciate: vocal, rough, overblown sounds.” Not surprisingly then most of the musicians who use the larger horn also choose to double on saxophones, using the more sonorous instrument for a change of pace or tone. Even Dolphy, who allied his virtuoso approach with a wildly vocalized tone to electrifying effect, notably on Ornette’s Free Jazz but also with Coltrane on Live at the Village Vanguard, also featured alto saxophone and flute. But that’s no longer the case. These four discs, feature two reedmen who have taken bass clarinet as their sole axe and they make a convincing case for the scope it can cover and the benefits of specialization. Rudi Mahall (veteran of various groups led by pianist Alexander von Schlippenbach) assumes a prominent role on Nicht Ohne Robert Volume 1, the first of a putative ongoing series documenting first-time meetings with upcoming German bassist Robert Landfermann. The young bassist has chosen his accomplices wisely to start this venture; alongside the experienced bass clarinetist are accomplished improviser and composer Simon Nabatov (piano) and Cologne regular Christian Lillinger (drums). Recorded at the renowned Loft, the four pieces are freely improvised without lead sheets, rehearsals or agreements to act as a safety net. Mahall jumps in from the off, starting in the clarinet range, Nabatov etching blocky chords in support, presaging a sequence of dense exciting interplay. The lengthy first piece sets the template for the set: shifting combinations with the focus passing round the band in unpredictable fashion. Nabatov probes and pummels with two-handed mastery. While Mahall dances elegantly on “I”, he traverses the further reaches elsewhere, signaled by the harsh blasts and vocalized whimpers of “II”, before enjoying a concluding duet with the nimble Landfermann on “IV”. Sonnenschirm under the leadership of drummer Heinrich Köbberling contains a 65-minute program of nine originals supplemented by three short duets for Mahall and each bandmember. There is a relaxed airy feel to the date with pleasantly harmonious tunes and soloing, like sunshine sparkling on a glistening swimming pool. Mahall seems intent on echoing West Coast tenor saxophone or clarinet in preference to demonstrating the distinctive traits of the instrument. In itself that is fascinating, but also fits right in with the milieu of Köbberling’s quartet. Expatriate American bassist Paul Imm contributes melodic solos, as on “Pisces”, and understated time while Köbberling is similarly tasteful and responsive. Pianist Tino Derado also doubles on accordion, overdubbed to round out some of the ensembles, and pitches in with some bright solos as on “You Better Put It In The Tupperware” and “Bobby”. While Mahall does inevitably tend to wildness around the edges, he might easily have been on standard clarinet for this comparatively mainstream session, an avenue worth investigating for those enamored of the ECM sound but looking for a new name to pick up on. Unlike Mahall, Chicago-based Jason Stein’s conception focuses firmly on the extremes capable of being extracted from the bass clarinet and all that lies between. It would be a fruitless task attempting to describe each track on Stein’s solo outing In Exchange for a Process. Each of the 11 cuts is an improvisation based around exploration of unconventional sound and pitch gained through a variety of advanced techniques. Stein seems to alight upon promising areas and then prospects them at greater length, like the keypad popping of “Paint By Number” or whinnying cries of “Temporary Framing of Dr. J”. However, notwithstanding Stein’s invention, ultimately the lack of differentiation afforded by charts, context or colleagues makes for a demanding listen even though spread over no more than 42 minutes. 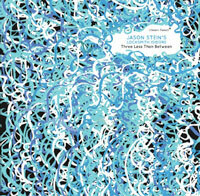 Three Less Than Between is the sophomore offering from Stein’s Locksmith Isidore. Over the course of an hour the trio delineates an intense free-form territory across 11 tracks, even though all are credited to the hornman. Stein has annexed associates who are as interested in timbre and tone as him, which manifests in a well-balanced trio of equals confident in how they will react and alert to new directions. Jason Roebke’s assertive bass veers between tough-toned bursts of rhythm, ringing harmonics and arco scrapes and blends well with drummer Mike Pride, who moves easily between clattering texture and more gradated time. Stein has some lovely moments, stretching out on “Stevenesque” with extended squeals developing organically from the theme, touching on the same sort of areas as his solo album, but with greater success derived from the more overtly musical setting. A pleasing passage on “Augusta Gun” pitches hesitant and slurred bass clarinet against metallic percussion textures before the walking bass takes to the floor again. While the heads are no more than functional, they provide a great launching pad for involved free collective improv, from the perky opening “Protection And Provocation” to the doomy portent of the low-key “Sad Crestwood”.